From the past few weeks, there are hot rumours surrounding around the next generation phablet from the innovative Samsung Galaxy Note series. It is expected that the Samsung mobiles will show off the latest offering Samsung Galaxy Note 3 shortly on September at the Samsung Unpacked Episode 2 event in Berlin. The reports also suggests that the smartphone will begin shipping to carriers and retailers in the same month after the launch. After the launch, it is expected to debut with the iPhone 5S, which is expected to be unveiled on September 10 and the HTC One Max, which is also expected to be announced sometime in September. Till date these is no confirmation regarding the Samsung Galaxy Note 3 price details and release date in India. But, some of the rumours regarding the smartphone has been weaving in the Asian mobile arena. Some of the source claims it can now confirm that the Samsung Galaxy Note 3 features with a 32GB model which is called to be the main variant and we can probably expect the 16GB model along with this phone. The owners of this phone is likely have approximately 25GB available for personal use, which is expected to give a plenty room for all the users stuff. Some of the rumours are also circulating around Samsung Smartwatch which is expected to be announced along with this handset and said to be launched in the month of October. According to the latest rumours, the device is expected to features a brilliant display of 5.7 inches with super AMOLED type touchscreen mobile support full HD resolution. It is also rumoured that the smartphone will be powered by a 2.3GHz Snapdragon 800 processor or an eight-core Exynos 5 Octa chipset depending on region. It will be complement to the processor, as it is bundled with 3GB of RAM to support high performance and multi-tasking. The smartphone will be running on the latest version of Android operating system like 4.3 Jelly Bean. On a camera front the device is said to be bundled with extraordinary photographic features. 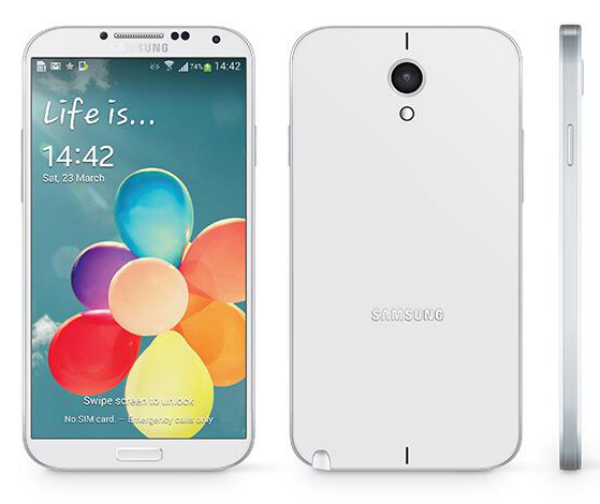 It sports the same 13-megapixel snapper of the Galaxy S4 ans it is supported by a Xenon flash. It is also loaded with 2-megapixel snapper up front for making video calls. Some of the leaked Samsung Galaxy Note 3 pictures clearly states that the device will feature a design similar to that of an oversized S4 smartphone which carries a slim profile and softly curved edges and Samsung Galaxy S3 will aslo get new android update, if we talk about the phone already have some great features.